Agility 201 Session 2 Wednesday 8 PM – FULL! « Agility 101 Session 2 Wednesday 6:30 PM – FULL! Now that you have the basics down you are ready for step 2, Agility 201. Work will begin on series of obstacles and the importance of handler positioning. Most of your class time will be spent working with different obstacle combinations and different obstacle placements. 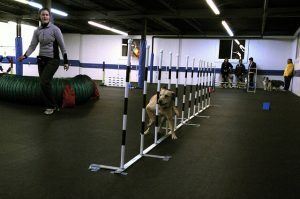 Special emphasis will continue to be placed on the contact obstacles and weave poles and their proper execution, crossing techniques will be introduced and each week new challenges will be presented to keep you and your dog at the top of your game. Come join the fun!